These hand embroidered ribbons were used to decorate the borders of Miao Skirts. Every bit of pattern you can see is hand embroidered with the most exquisite accuracy. The silk ribbons are now a lovely pinky-brown colour, but were originally dyed pink using a natural dye which has oxidised over time to the colour you see now. This helps us to date the textile to early C20. 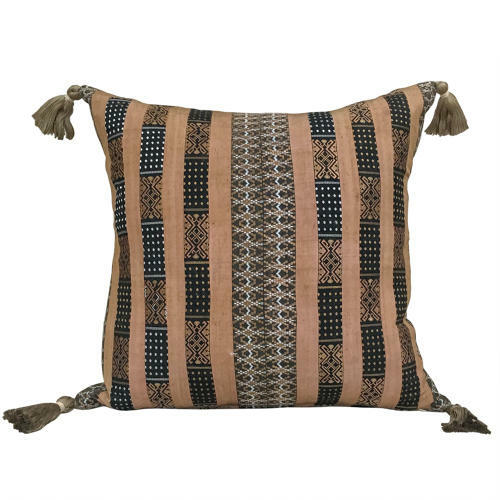 The cushion has handmade tassels at the corners, is backed with vintage hemp, has zip fastener and feather pad.